This is, in reality, the view from Round How. 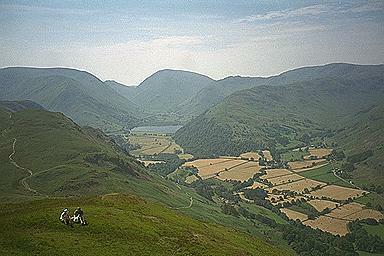 On the horizon from the left are: Caudale Moor, with the satellite ridges of Hartsop Dodd in front of it, and St. Raven's Edge to the right; the gap of Kirkstone Pass with Wansfell just visible; Red Screes with the faint outline of Middle Dodd in front; Little Hart Crag; and Dove Crag. The summit of Hart Crag is just out of frame to the right, but the ridge of Hartsop above How leads down from it in front of Dove Crag and Little Hart Crag. The lake is Brothers Water. The path from Patterdale to Angle Tarn, avoided in this route, shows very clearly on the left. Larger version of this picture.